A free, public talk by Anthony Graves and Carla Herrera-Prats, who collaborate as Camel Collective, discussing the history of their work and its interest in theater and pedagogy. Formed in 2005 Camel Collective works through processes of archival research, dramaturgy, printmaking, painting and photography, focusing on the problematics of labor, pedagogy, theater and collectivity. 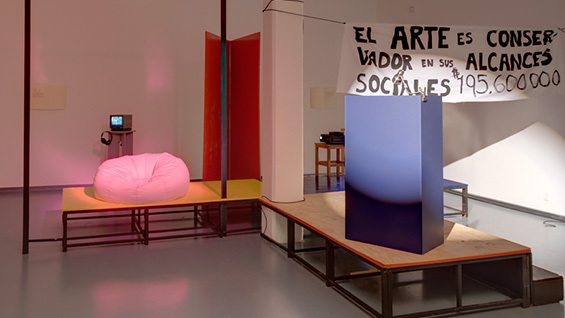 Camel’s recent exhibitions and performances include The Second World Congress of Free Artists at Casa del Lago, Mexico City (2013), Una Obra Para Dos Pinturas at the Trienal Poli/Gráfica de San Juan (2012), A Facility Based on Change at the Massachusetts Museum of Contemporary Art, MassMoCA (2011) and Howls for Bologna at Overgaden Institut for Samtidskunst (2010). Anthony Graves and Carla Herrera-Prats appear as part of the Interdisciplinary Seminar, created as a discussion series on artistic practice for the students of the Cooper Union School of Art and the creative community that surrounds them. Lectures are free and open to the public.